A Republican campaign in Pennsylvania attacks a Democratic House candidate for things that weren’t her doing in a strained attempt to tie her to a convicted cop murderer. A robocall from the National Republican Congressional Committee went out to 8th District voters on Sept. 27, claiming that Kathy Boockvar, the Democratic challenger to Republican Rep. Mike Fitzpatrick, is “too radical.” But it only cited examples of incidents involving her husband and a colleague — not Boockvar herself. The call was part of a campaign, which includes an online ad, that attempts to connect Boockvar to Mumia Abu-Jamal, who, in 1982, was convicted of killing Philadelphia police officer Daniel Faulkner. But the NRCC doesn’t directly tie Boockvar to him at all. Instead, the group focuses on the fact that her husband, Jordan Yeager, acted as legal counsel to an Abu-Jamal supporter nearly 20 years after his conviction, and that Yeager also represented a woman in 1996, who recanted her original testimony against Abu-Jamal, saying that she was pressured by police. The NRCC also brings up the fact that Boockvar once worked with someone who was critical of the Pennsylvania Supreme Court and who said that Abu-Jamal deserved a new trial, and that Yeager was once a member of a lawyer’s association that held a forum in honor of Abu-Jamal in 2011. The NRCC gets the facts right. But they don’t amount to much more than guilt by association. 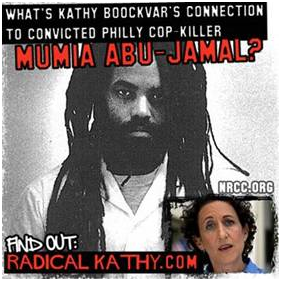 NRCC Robocall Transcript: Hello, I’m calling from the National Republican Congressional Committee at 320 First Street Southeast, in Washington, DC, 20003, 202-479-7000, with a recorded message about congressional candidate and legal activist Kathy Boockvar and convicted Philadelphia cop killer Mumia Abu-Jamal. The husband-and-wife law firm of Boockvar and Yeager has represented one of the leading activists for Mumia Abu-Jamal – and Boockvar’s husband was a lawyer for a witness to the murder who accused the cops of pressuring her. Boockvar’s husband himself accused the Philadelphia police of intimidating witnesses to the murder. Boockvar’s colleague at a legal activist group accused the Philadelphia police union of having the state’s Supreme Court in its pocket when it comes to Abu-Jamal. Last year, a group tied to Boockvar’s husband, held an event at the Constitution Center honoring Mumia Abu-Jamal. The cop killer called into the event from prison. Call Kathy Boockvar at (215) 839-9383 and tell her that’s too radical for Bucks County. It’s true that “the husband-and-wife law firm of Boockvar and Yeager has represented one of the leading activists for Mumia Abu-Jamal,” as the call script says. Yeager did represent Frances Goldin during a 2000 case, according to a Village Voice article. Goldin was one of 95 protestors arrested at a demonstration outside of the Liberty Bell on the anniversary of Abu-Jamal’s conviction. She was charged with petty crimes, fined and sentenced to one year of probation. The “colleague” mentioned in the robocall is David Love, who worked with Boockvar for a time at the nonprofit Advancement Project. Love, according to a 2011 Patriot News article, once wrote a commentary which “detailed evidence that cast doubt on Abu-Jamal’s conviction for the murder of Philadelphia police officer Daniel Faulkner and said the former part-time radio journalist should receive a new trial.” The paper also reported that Love “accused the Pennsylvania Supreme Court, which rejected Abu-Jamal’s appeal, of being in the pocket of the city’s police union.” But, in the same article, Boockvar denied having anything to do with Love’s writings. And it’s true that Yeager was once a member of the National Lawyers Guild, which last year held a “We the People” forum in honor of Abu-Jamal and Troy Davis, who was executed after also being convicted of murdering a police officer in Georgia. Abu-Jamal spoke to the crowd from prison, according to a Philadelphia Tribune article.